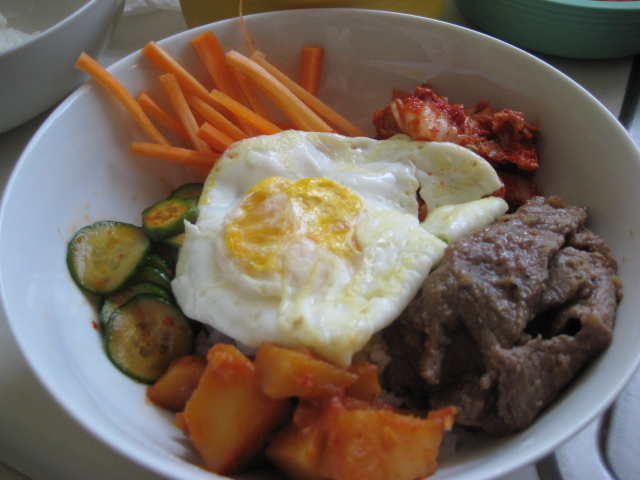 Bibimbap | Ooh, my favorite! I should probably be embarrassed to admit that we’ve been in our new apartment for an entire month and we’re still not quite settled in. Today was the first official Lazy Sunday we’ve had since Christmas, and I’ve been experiencing some major cooking withdrawal. I wanted something a bit more involved since it had been so long since I was in the kitchen, and I have been craving Korean food, so I decided on bibimbap. If you’re not familiar with bibimbap it is an amazing dish of thinly sliced beef and a collection of wonderfully flavored sides (called banchan) served over rice. I’m not sure if it’s officially still bibimbap without the hot stone bowl (and crispy rice at the bottom!) but its close enough for me. I came across this recipe for bulgogi last year and loved it! 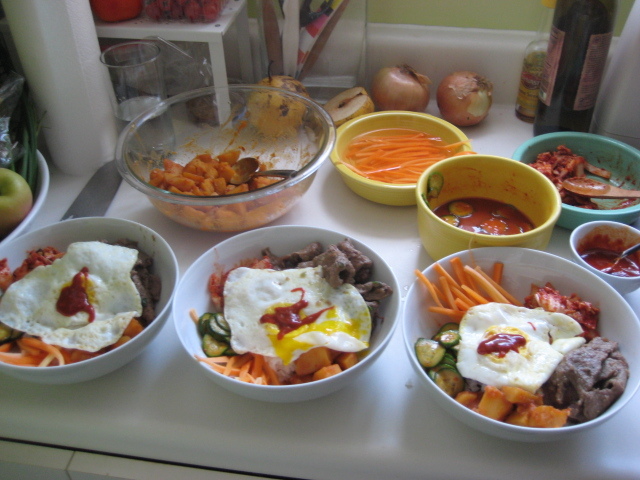 For this go-round I wanted to add the homemade kimchi and some other yummy sides. Most of the recipes comes from Kitchen Wench and they are all amazing! The bulgogi and kimchi are were secret family recipes and I can’t rave enough about them. I also borrowed her braised Korean potatoes recipe and thus have a new favorite potato preparation to add to my list. Because it was so kind of Ellie to share her family’s recipes, I’ll leave it to her to detail the recipes for you (she’s done a beautiful job), so see the links below! The cucumbers are a quick pickle recipe I adapted using gochujang paste. This is definitely a weekend project and takes a fair amount of time to plan and shop for, but for me it made for the perfect weekend. The kimchi alone needs a few days, but even though we didn’t wait the full three days for it to ferment it was still unbelievably good. I’ll let you know how the rest tastes after the next few days! 1. Whisk together the vinegar, soy sauce, sugar, gochuchang, and sesame oil in a large bowl. Add the cucumber sesame seeds and let marinate in the refrigerator for at least 1 hour before serving. NOTE: With the recipe above I was able to feed myself and two very hungry guys, AND had enough leftovers for my foodie friend Brian for lunch tomorrow and another two lunches for Tony and me next week. Since you’re spending so much time in the kitchen it makes it worth it to save yourself from a few extra meals for the next week. Mmmmm! You make Korean food look much better than even Koreans do! Why, you’ve just made my day! Thank you for the lovely note, but I owe everything to the wonderful recipes. Let me know if you try them.